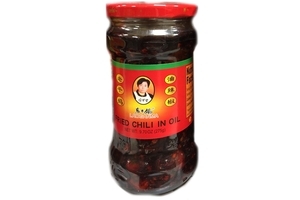 Laoganma Fried Chili in Oil in 9.70oz (275g) jar. 老干妈 Laoganma is a brand of chili sauces that are made in China. The sauce is produced by Laoganma Special Flavour Foodstuffs Company, which was established in 1997. Development of the sauce began in August 1996 by Tao Huabi (陶华碧), who employed 40 people at that time in a workshop environment.Lao Gan Mas Chili is very popular in China and Hong Kong. it is also very popular in Singapore . This hot sauce has peanuts in it. Watch out for that if you have or you know people with allergies. Product of China.